So I managed to watch this ancient movie and see if it was any good for others out there. I didn't see many anthropomorphic movements; I missed most of the first movie, but I've seen footage and snaps of them standing up like humans and acting like them. I was disappointed that they didn't use that much in the sequel; I suspect the directors avoided it. Unfortunately, Alpha and Omega 2 is short; the whole thing was about 40 minutes long, without counting the credits. It wasn't very surprising; I'd heard people complaining. While I hope the third one will be longer [one whole minute longer], let's start by talking about the graphics. This is my first review on Flayrah; also, don't expect my English to be that great, I lack certain words I need I think, and it's a bit of my style, especially if I had to extract nearly everything. Also, spoiler alert! If you don't want to get spoiled, watch it first or skip them somehow. Now it's hard to say if the graphics are "worse" (as in less-detailed; the original was perfect) or "different" when you compare it to the original. Yet I'm a graphics fan who likes to point out details – like those possibly-2D mountains I saw in the distance across fields in this movie. I'm not a guy who thinks every "now" movie needs to be like the other "now" movies, even if some style had to be similar. The graphics clearly looks OK as an "older" kind of movie; as if you were to enjoy a classic "2001 movie" made by a new company. You could totally accept it as such if you were browsing through "old" movies, or at least in the context of a new-born company "trying". I'd say they did a pretty good job for a "lone company" that isn't a known popular studio. It might be questionable to compare it to a "known company" such as Pixar. Setting aside the idea that the "murky" graphics that often shows up in Alpha and Omega 2 is a "different" design, I would honestly say, they should have made them look like Alpha and Omega. The lighting effects seems to lack depth in darkness, but I can't describe it that well. Is it the "wrong" shading? If you examine the original, you could clearly see the shading matching well with nearly everything. When I saw this, I thought "what happened to the shading…?" Though I clearly noticed it as a "graphics experience fan" – perhaps it's not too bad? Is it just a style? Arg!! Personally, in a non-critical way, I prefer the old shading. I think the reason they look so "murky" sometimes was because they were trying to use a fur effect as I heard in "the making" of this movie. Speaking personally again, if they needed to try that, please keep it like the same old shading like the first! It could be also the time on their hands, and the money, but I'm not sure if that's the case. Now back onto the graphics, are they bad? Well, no, they are not. Of course, they are clearly not anything like "modern" animation, but you can accept it as it's own thing, just like old chiptunes on the NES. Trust me, I've seen less-polygonal movies and episodes, even on the Internet, and I enjoyed them, as long as the graphics were enough for me. Hell, you can even enjoy a classic "Nintendo 64" episode of the "most" famous game Super Mario 64 with a really neat story. (I'd love it if one of those made it on the big screen.) [Ed: Like "Super Mario Bros."?] Besides, graphics have never been the most important thing to everyone. As in video games, some will go for the story more, the characters, or even one little joke. I think movies need to be thought of like this; without doing so, it can destroy the potential reputation of a possibly-great movie that others could enjoy. So many new things were bashed because others tried to compare it with classic cartoons, ending up a huge "failure" just because it was "different" to the classics. Because of this, every 3D movie based on a classic cartoon is possibly going to be bashed to hell because people can't accept "change". Or designs; but which one? Character Design: I think these were amazing; a good classic take on "anthropomorphism" - the result being some kind of "strange" style but this "strange" style to me was something I never seen before (at least with wolves and in 3D); and even if I had, I totally loved it. Critically thinking, even for the sake of improvement, I will never call a "art style" or "design" terrible and suggest changing it to another, destroying its own spirit. Clearly, they stand on their own. I remember hearing people complaining about the so-called "lack of personality" in the original; some suggested changing the designs to make it "better". Now then, I think there IS such a personality in each character of this movie. Each 3D design already seems recognizable; see the traditional-looking female pup, and you would know who that wolf is well enough; the same with the name. Kate and Humphrey are also familiar enough. Back to the idea of changing the designs; I looked at the concept art, but it seems too generic (something we've seen before, anyway). It's OK to remake something like that, but the idea of changing what's already fine on it's own path to it, is a threat to new art directions. I'm very glad they didn't change the designs. This is where it starts - the animation absolutely isn't much like "modern" movies. However, it is similar to the "old-school" graphics, so it may fit well in that picture as a whole. Or does it? I think we'll get to that soon. The design stands out, because art styles have always had their design to be enjoyed. If you think about the picture, you could see a Pixar version of Kate and Humphrey without their designs changed. To take another example, you could see a "distorted monster" in a high-definition picture based on a 1980 first-time 3D modelling machine, know what I mean? Not that I'm saying the wolf designs are distorted in any sense! I feel, maybe even in a critical way, that some of the animations were very choppy, such as the "quick", repetitive running. As a whole it didn't look too "bad", but some of it did look rushed. I think there were plenty of problems and they could have done a lot better with certain things. If you compare it to the original, even not having seen all of it, you could clearly tell Alpha and Omega was better here. I have one thing that I'm holding back, but I'll talk about the plot first. The plot and story were decent, but near the end, they could have gone on, or finished something. Is that fair? I'm not so sure – but I think they could have made the fight scene and the way they find Runt longer, couldn't they? I have an odd feeling that the "home is where family is" bit was used just to make the movie finish without a "cut-off". Now, the story itself. Without having much to compare of the first movie, I suspect the sequel had some unpredictable moments in good ways and still had a new kind of style, regardless of whether the story resembled that of other movies. Perhaps we shouldn't compare it to others; new watchers could still enjoy it, and even those who've "seen it" could appreciate different realizations (even those claiming to be "critics"). Anyway, the story I heard was "improved". 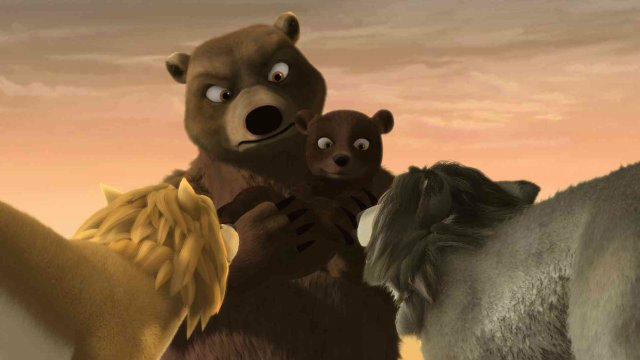 A lot of parts were a bit surprising and classic, and the way they had to save Runt and all with the bears and trying to get him out of this other small pack was fun. In this, Alpha and Omega seems unique. Though the first movie as a whole did look unique, even if some parts reminded me of other movies (as many movies do). As I said, the story was a bit short, but seeing other people complaining that it ended too fast, it looks like they were enjoying it at least and… yeah, they should have made it longer. Perhaps they could have called this a Christmas Special without adding the number "2" at the end? Then, later, they could have made a non-special sequel. Update: You know, I have actually saw a review of this movie somewhere. It wasn't much of a plesent review but I noticed one very interesting part of the review I should of noticed but failed. It was that it didn't even looked like Christmas. When thinking about that, the person may have made a good point, probably. I cannot even remember if the word "Christmas" was even used! It just looked like yet, another generic story that had nothing to do with Christmas. It would of been nice to have the wolves to somehow build a Christmas tree in the woods like some anthropomorphic creatures did in some Disney movies (If I could remember) and others. I can finally show this! 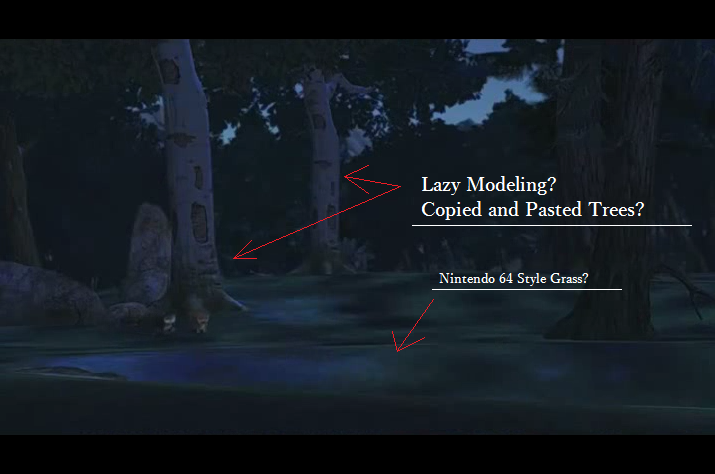 I defended the graphics on their own merits, because you can clearly enjoy any form – like playing a Nintendo 64 game – but is it a good idea to mix very low-resolution grass textures with higher-end graphics like that? They should have made the grass "fit in" more. It doesn't ruin it for me and it's not a bad, bad issue, but they could have done better. If you're looking for a wolf animated film for a holiday [Ed: Perhaps Christmas in July? ], I'm sure this is still great for you, and better than nothing. Especially since there's no other films about wolves like this. Good for kids, and depending, it could even be great for adults. Also inspiring. I think Alpha and Omega 2 (or should I say Alpha and Omega Christmas-like film) does have less-compelling graphics and such than the original, but it's not bad either. Just "OK". While the original Alpha and Omega's story may have been a tiny bit similar to others, it doesn't make it bad on the whole; like any other creation, it has its own unique style to impart. Those who wanted a more "original" story may be happy for the sequel, but be warned that it may be short and could be hard to understand at the end. This sequel retains some "impossible" movements such as climbing a tree, standing, etc. If you enjoy classic cartoon animal antics, you may like this a bit, but you may not see much of them. The first one used this more, I think. Did anyone else who's seen it enjoy the film? I suspect some didn't, but after studying the environment… if you say anything, it'd be nice to not give negativity from a global perspective – use a word, "personally", in it. It's not my website but I think it would be more open and honest. Yes, this was also somewhat a reaction to what critics thought, but well, more of a reaction against any form of "rotten effect" to cause people to talk less openly about this indie company and its movies. The current "environment" range is set on 40/60 percent rotten/unnatural; to a point that whenever it's openly introduced to a news website (take Cartoon Brew for example), a set of people try to force their hateful opinion and even possibly go against the natural right to introduce it to future fans and/or graphic indie-experiencing people as well. Critics are interested in pointing out real/less-biased flaws that people tend to agree on, but they shouldn't be used to declare what is "good" or "bad" in the way that Rotten Tomatoes does it. Like I said, it's up to the viewer and people should honestly, openly talk about such work for the future of other kinds of fans. It's wrong to the core to declare a singular "average" public view of what is thought about a piece of media; that's just another opinion being forced upon the viewer's experience. These are my thoughts; I don't see it as unfair to criticize things like this. After studying culture, I see it as causing many problems in the future, perhaps destroying dreams, hurting companies, etc. – so I thought it was very important to bring this out, especially to a furry "open" community. I don't know if a review is the right time to talk about this, I just wanted to put it out there as an extra thought. “Alpha and Omega 2: A Howl-iday Adventure” is made by the same studio that released the original “Alpha and Omega” back on September 17, 2010. And “Alpha and Omega 3: The Great Wolf Games”. And the forthcoming “Alpha and Omega 4: The Legend of Sawtooth Cave”. The main difference is that “Alpha and Omega” was a theatrical release, and the sequels are all direct-to-DVD releases. Studios tend to spend more money on their theatrical releases, so theatrical releases invariably have better production values/higher quality than direct-to-DVD releases. Even so, direct-to DVD (a.k.a. direct-to-video) releases vary according to the studio. 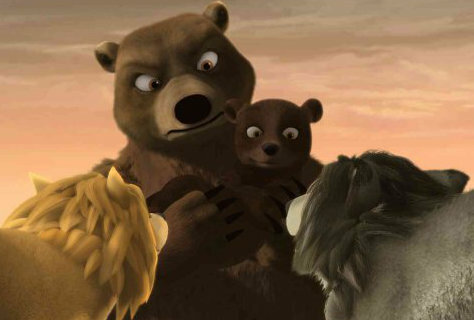 Disney’s direct-to-video releases look better than Crest Animation Productions', the studio that has made all of the “Alpha and Omega” features. According to the definition accepted today by the Motion Picture Association of America, and by every (I think) cinematic studio, a feature (theatrical or home-video) must be at least 40 minutes. That’s all. Most audiences today feel cheated if a feature is not at least 60 minutes, and the usual length is 80 minutes to two hours. But legally, a home-video company can advertise a 41- or 42-minute movie, or 45 minutes like “Alpha and Omega 2”, as a full-length feature, and get away with it. “[T]his ancient movie” … Are you being sarcastic? “Alpha and Omega 2: A Howl-iday Adventure” was released on October 8, 2013, less than a year ago. "According to the definition accepted today by the Motion Picture Association of America, and by every (I think) cinematic studio, a feature (theatrical or home-video) must be at least 40 minutes. That’s all. Most audiences today feel cheated if a feature is not at least 60 minutes, and the usual length is 80 minutes to two hours. But legally, a home-video company can advertise a 41- or 42-minute movie, or 45 minutes like “Alpha and Omega 2”, as a full-length feature, and get away with it." Oh God, something now tells me that the company wanted to make this even more shorter, but couldn't because like you said.. Also, yeah I do feel "cheated" or something, but I still wish it was at least an hour long, since "40 minutes" feel very short personally. It's very close to a length of an average TV show, which is why I suggested these so-called sequels as TV-Specials or something, from another article on here. "“[T]his ancient movie” … Are you being sarcastic? “Alpha and Omega 2: A Howl-iday Adventure” was released on October 8, 2013, less than a year ago." I might of been using it like it was "ancient" like some gem. Maybe I should of been more clear or used another word. This is why a lot of movies can be made to be first shown as one-hour TV Specials, which are usually only 50- or 52-minutes plus commercials, and then repackaged as "full-length movie" DVDs without having to cut anything out. How many DVDs have you seen with obvious places for commercial breaks in them? I don't remember besides some that was still originality over an hour I think, but I still could feel the "sequels" of these movies to still feel too short with commercials added (Never tested that, not sure how. xD). I could only say, it's like watching episodes of "Lost", rather than movies on TV. However, I only watched Lost on Nexflix. Maybe calm down with quotation marks. Is this a review, or is this a "review"? Lol, I didn't even notice that. After you mentioned it, I looked up and saw them "everywhere." Sometimes I do that to labels too, to make people read that it's "labeled" by man-kind. Otherwise it would look like I am saying it as a "fact". Get what I mean? Well, actually, your reason in the second paragraph is right; you are telling me it is supposed to be read somewhat ironically. Your first reason, though, is just a lack of confidence; have faith in yourself and what you're saying will come through (or at least have faith in your editor to keep you away from the big mistakes). I could, though, I think I meant so that titles of Movies, Games, etc wouldn't go with other words.. Examples: "We got this short movie called "Alpha and Omega 2 - Howl-iday Adventure" with snow!" "We got this short movie called Alpha and Omega 2 - Howl-iday Adventure with snow!" It could somewhat make people misread a title, though, I can still probably give it a try if you meant that. Uh, I don't know what you're connection to the original topic at hand is with this, but movie titles are in italics in Flayrah's style, so that's how you solve that problem. Alright I guess. Maybe I could use that. I like to give out some info about this. This was originally made back in 2013, before the third movie ever came out.. So some of this (The graphics at least) is probably out-dated. I will also like to say something about the graphics, again.. Honestly, I do think the graphics are a downgrade kind of. The first one actually had shocking detail (In a good way), perhaps had very good visual for detail too. e.g. The fur (First one of course). It looked very effected, perhaps more than "modern movies"? I don't know for sure.. They did make the graphics much more better in the third one than the "first sequel" *Cough maybe spin-off title*. Animation (Movement)? Barely I think. It's relatively easy to create a detailed 3D model of a character, once, just as it is relatively easy to create an evenly-lit pinup of a character floating on a blank background. It is not so easy to make them move realistically; to ensure that they are evenly lit in all the scenes they are in, etc. It takes time, and time means money. It's also quite possible that the people who originally made the models handed them off to new hires and said "here, make a sequel - we're busy with Norm of the North". They figure the target audience won't notice, or complain. I don't know.. I been modeling stuff based off some free tools for years now, and I can say, it's not easy (Depends) I think. Making 3D characters, and adding fur effects, especially for a character rather than land-scape or structures (What I often do), may take a lot of time. I have also heard rigging the models of these wolves "wasn't pretty" somewhere. i.e. Hard work. Can I ask, have you ever done 3D modeling yourself before? For animation, yeah I think I agree. It's not easy. I think you do make a good point on the money and time. Yet, for the third movie, they actually fixed the "murky graphics" but not so much for animation movement for it's cartoon smooth animation purpose. It might be informative to repeat "The Making of 'Alpha and Omega 2'" here, even though it has been on Flayrah before. It shows Richard Rich, the man responsible for making "Alpha and Omega 2". You "use" more "quotes" than "Jack Kirby" did in his "scripts". And I don't "mean" that as a "compliment". Yet, it could be my style of writing, I don't know. Oh, I'm sorry, forgot about that! You should be on the contributor list now, which will give you editing back. Huh, I was just noticing the "edit" buttons. On my other one, I also never gotten an edit button for a while I think but now I noticed it on both of my stories/posts.